Report cards are on their way! We’ve just finished folding and sealing the report cards, and I’m about to drive them to the post office now! Our teachers have invested an enormous amount of time to assess your kids’ mastery of concepts and write thoughtful comments for you to read about your child’s progress and growth, and I hope you enjoy reading them and reflecting on them with your child. Look for them to arrive in your mailbox on Monday or Tuesday. If you have any questions for the teachers, *please* let them enjoy their winter break and hold off on emailing them until second semester. Also, if you wish to make a year-end, tax-deductible donation to the Da Vinci Schools’ Annual Giving Campaign, you can make a year-end gift at: http://www.davincischools.org/makeagift.shtml. Have a terrific break! Second semester will begin for the kids on Monday, January 11th. Dear DVS Families, thank you again for trusting us with your kids’ safety today (and every day). It was another terrific day of presentations by the kids! For those of you who have already attended your child’s POL, please remember to sign in at http://tinyurl.com/DVSParentParticipation ! Thanks! Because there has been no threat made to DV or Wiseburn, we will hold school today as we normally do unless directed to do otherwise. I will keep you posted. Next week is a special schedule for presentations of Learning, with students attending either the morning session or the afternoon session, depending on when the POL is scheduled. (Supervision will only be provided for students during the session for which they are scheduled.) Please help your student practice their POL by being an audience for them this weekend, and make sure to attend and watch their presentation! Also, please consider including Da Vinci Schools as you make year-end charitable donations! You can make a year-end, tax-deductible gift at http://www.davincischools.org/makeagift.shtml. Thanks to the extraordinary generosity of Chevron, Belkin, Northrop, and Kinecta, all donations to the Da Vinci Schools Annual Giving Campaign will be matched dollar-for-dollar, up to $50,000. This matching challenge is only available for a limited time. Make your donation or pledge by March 31, 2016 and your gift will be doubled. All pledge payments must be received by June 1, 2016 to be eligible for the match. Dollars raised through the Annual Giving Campaign benefit every K-12 student by providing hands-on curriculum for every age level, a $1,000 materials budget for every teacher, innovative educational technology, and the day-to-day operating expenses that are not funded by the state of California. Reminder to students: the deadline to turn in any late or re-submitted work is tomorrow at 4pm! Keep chiseling! DV Schools Annual Giving Campaign – Double Your Impact! Please consider joining Da Vinci families and staff in pledging your support to Da Vinci Schools by joining our Annual Giving Campaign! Make a year-end, tax-deductible gift at: http://www.davincischools.org/makeagift.shtml. Please contact Carla Levenson at clevenson@davincischools.org with any questions you may have about AGC contributions. Thank you for your support! Next week is the last week before Presentations of Learning! Please make sure to confirm with your student the date and time of their POL presentation so that you can make arrangements to attend, and help them prepare by being an audience for them at home! Friday, 12/11 at 4:00pm is the deadline for all coursework to be submitted. Don’t forget that the all-DV Schools’ “Winter Wonderland” dance is tomorrow night from 7-10pm. Attire is semi-formal and tickets can still be purchased for $15! 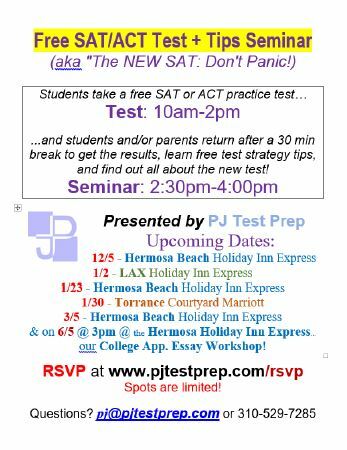 Here is some info on free SAT Test & Tips seminars provided by PJ test prep, who runs our ACT and SAT test prep programs during winter and summer break! 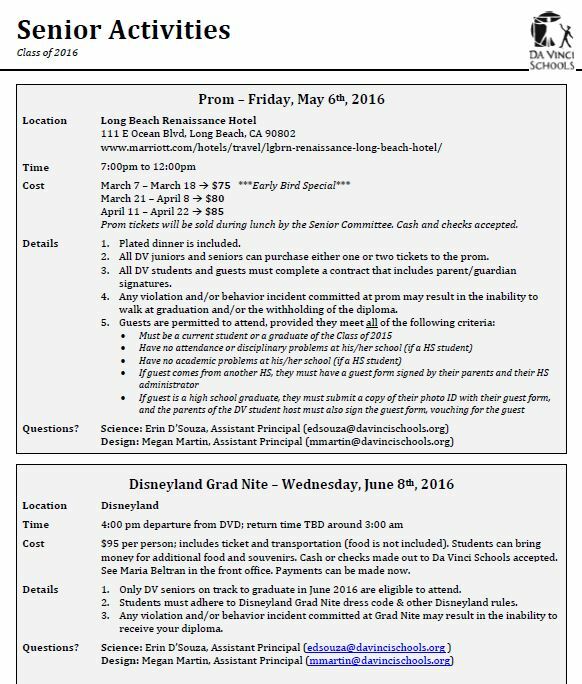 Here is the latest info about graduation, grad night, prom, senior portraits. 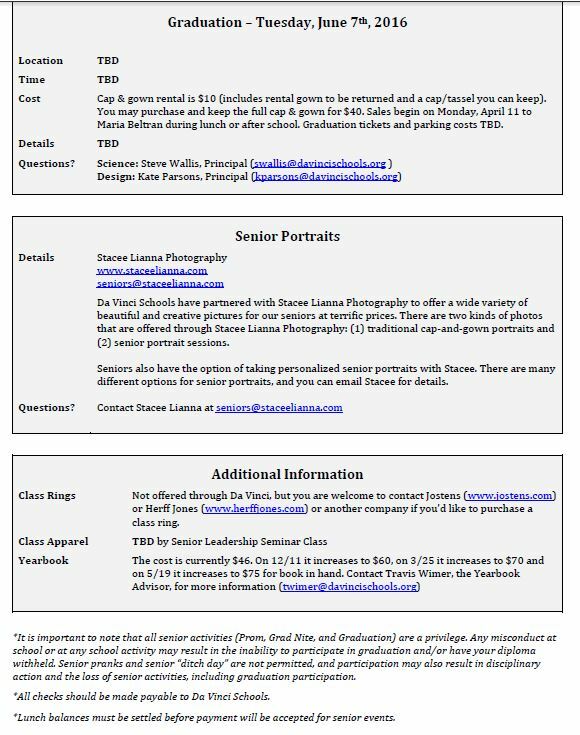 Click to download pdf: Senior Activities 2016 (DVS 12-1-15) , and more!